Around 4 pm I arrive at the Military club – the place where one of the most brutal events for this year will take place, the concert of the American death metal veterans INCANTATION. John McEntee and company are in Bulgaria for the second time, their previous show was in 2007, supporting KRISIUN. The area surrounding the Military club is nice – the sunset is near, the river Danube is calm and at the other side we can see Romania, from which a lot of visitors will come. The fans start to gather in front of the hall, where I can see one of the support band – the Italians from RISE OF TYRANTS. The young band is very friendly and talks with everyone who wants to have a a chat with them. With pleasure they respond to my questions. They share that we the successor of their debut album “Trauma” will be ready in few months and that 7 of the 8 new songs are already written and also that we will hear them play mainly new material. The say that they are pleased to play in Bulgaria, according to them the fans in Easter Europe are more “wild” and crazy than the fans in the West, beside that they say that they had plans to come in Bulgaria but the tour was canceled. While I talk with RISE OF TYRANTS, more and more fans from every corner of the country and from other countries as well, gather around the hall, musicians from Bulgarian extreme bands can be seen as well – there are no “random” people. In the meantime we hear that there are problems with the baggage of INCANTATION and most probably they won’t have any merchandise. Later the main heroes of the night arrive, along with the Romanian death/doom band SINCARNATE. Exactly at 19:30 RISE OF TYRANTS are on the stage, in order to start the event. Some people are in front of the building but the bigger part is inside, listening to the band. Combining old school death metal with a bit of modern sound and even some black metal influence , RISE OF TYRANTS definitely please the fans. Their newer material is a good successor of their debut album, although their music is now centered around their new vocalist. Incredible melodies, combined with the apparent pleasure of the band, all of this is valued from the public. The wildest reaction is when they play the song “Never Relent” (the only one from their older material). Although their set isn’t very long, it definitely charms the people at the concert. They definitely justify my expectations, with their high level playing, it’s a band that I would love to see again. After a short break SINCARNATE occupy the scene and around 20:40 they start their appearance. The band plays for the third time in Bulgaria and it is obvious that they enjoy it. The fast and aggressive death metal of RISE OF TYRANTS is replaced with slow doom parts, a church choir and keyboards. Their set consists of new songs as well as older ones from their debut album “As I Go Under” and the EPs “Nothing Left To Give” and “On the Procrustean Bed”. The number of visitors is growing and the atmosphere that the band creates is hard to describe. Around 21:00 SINCARNATE get off the stage where preparations for the final band begin. While I wait for the INCANTATION show I go outside, where I see Riccardo Arrigoni – the bassist of RISE OF TYRANTS. He shares with me that he is really satisfied of the Bulgarian fans, and their own appearance, despite the small technical problems on stage. He also says that he would be very happy to play in Bulgaria again. Unfortunately I can’t speak with no one from SINCARNATE, in order to hear what they think. Around me the first reactions of the fans appear – completely positive. 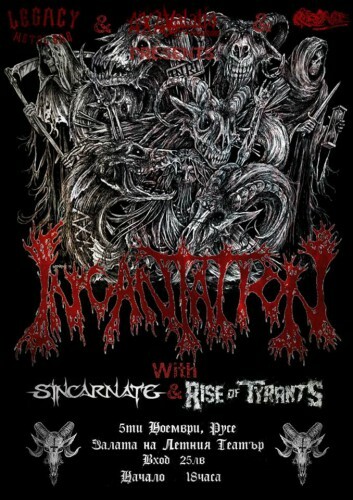 21:30, the hour when INCANTATION take the stage by storm. After a short salute they start with “Carrion prophecy” from their latest album “Dirges of Elysium”. The music is completely uncompromising, professionally played music is a pleasure for the ears of every death metal fan. John McEntee announces the songs, one after another – “Ethereal Misery”, “Lead to Desolation”. We give our oaths to the Armageddon, while listening to “Oath to Armageddon” and “Obelisk Reflection” in a complete trance. The insane classic “Nocturnal Dominion” from their cult album “Mortal Throne of Nazarene” follows. Incredible energy flows from the drums of Kyle Severn – a person well known to the Bulgarian fans. The show continues with the same name song from their album “Vanquish in Vengeance” after which we return 24 years back in time, to their debut album “Onwards to Golgotha” with “Unholy Massacre”. This band is an incarnation of the death metal music, nothing more, nothing less. The incredibly fast moments change with slow and heavy ones, while beer is being spilled on the floor, a mosh pit is forms and the fans go completely insane. Among the people attending I can see musicians from SINCARNATE and RISE OF TYRANTS. A few more songs and the end is about to come. After the band gets off the stage we continue to scream “INCANTATION!”, we want more of their death metal magic and they respond to our call. The band takes the stage one more time and plays the mandatory songs “The Ibex Moon” and “Impending Diabolical Conquest”, which marks the end of the event. It’s time for us to gather our torn bodies. After the end of the concert the fans have the chance to take pictures with the band, to have a chat with them or to buy something from the merch stand. I go to Kyle Severn to ask him a few questions – this is his first visit to Bulgaria, he couldn’t come to their previous concert due to personal reasons. He shares with me that he is really satisfied by the place, the fans and their appearance as a whole. What John McAntee says to me is quite similar, he also says that according to him the fans are fewer than the previous time (there are exactly 100 visitors) but more energetic, the leader of the band also shared that their next album will be released most probably at the beginning of the next year. The bassist Luke Shively and guitarists Sonny Lambardozzy can also be seen. People start to move towards the Legacy club, where later on musicians from INCANTATION come. I don’t think that any negative remarks about the concert could exist. The fans were very good, the bands played flawlessly and the attitude of the organizers was perfect. Without any doubts – the night of the 5th of November will be remembered as one of the best extreme metal events for this year.